Seeing as fall camp has officially started and I haven't written anything here in over two months--and nothing about football since April--it may be time for an update. In the last few weeks, I moved from the sunny concrete jungle of West Los Angeles and have returned to Michigan to pursue my graduate degree at U of M--FWIW, I'm going to the School of Information. What this means for the blog moving forward is uncertain. No, I will not be attending press conferences and reporting on them. For that, you can continue visiting MGoBlog or whatever source of actual reporting you frequent. I'm expecting my course load to put a strain on my free time and hence my ability to post daily updates, but we'll see whether or not that's the case. Currently, my biggest obstacle is my new computer and lack of Adobe Photoshop (no Wet Owls? ps, Fall Camp!) and Illustrator (those play diagrams that have become my bread and butter around here). I'm working on getting those but as a broke, unemployed student, getting the Adobe suite is tough. It’s clear that barring a massive upgrade in AI development in the next few years, EA’s football series is kind of stuck, a problem largely brought on by the rules of football more so than any failing of the developer. 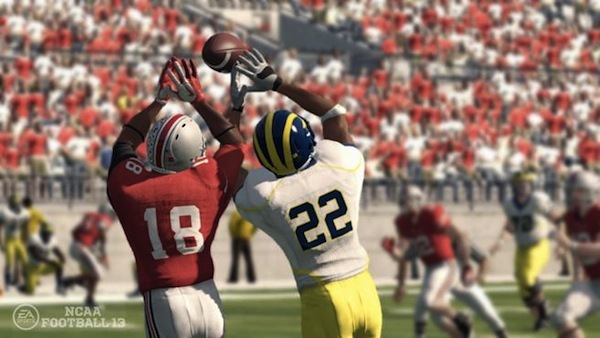 The main issue facing football video games currently is that there are too many players. Each team fields 11 men, but the player only controls one, meaning the outcome of any play is dependent on whether or not your AI wide receiver can get open against AI cornerbacks, for example. There are obviously considerations with regards to play calls—running man-beating passing routes against man coverage and vice versa—but anyone who has ever played an EA football game knows that there are just times when the game decides that you’re not winning. And these problems extend beyond the skill position players: if your offensive linemen are unable to block the defensive line, your play call hardly matters. That's it for now. As news starts to float out from practice, I'll start posting more regularly. If there's anything you want to see me cover, let me know via e-mail or in the comments. Otherwise, welcome back. Go Blue!